So, the knitting machine. It was secondhand, in excellent condition but for all the things that happen when a machine has been sitting unused for years. I would guess that most people who buy a secondhand machine would have to do the following too, so I’ll record these tidbits here in case someone stumbles across this post in search of guidance. 1. Clean and oil all the surface areas. Because I didn’t have anything else, I used fresh new sewing machine oil, although apparently gun oil is better (who in Australia has gun oil?). Don’t use WD-40, apparently it gums up after a while. Better to use Inox, which I now have and love. 2. Replace the sponge bar. Instructions here – starting from “What is a knitting machine sponge bar and where is it located?” through to removal of the old one and putting in a new one (including how to make your own, although I ordered mine for about $15 from Sunny Choi at the Hong Kong Knitting Machine shop). 3. 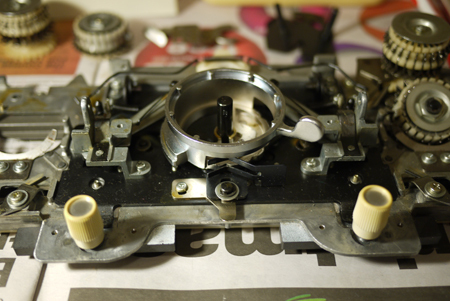 Take apart the carriage to get rid of old, gummed up grease, then clean & lubricate. 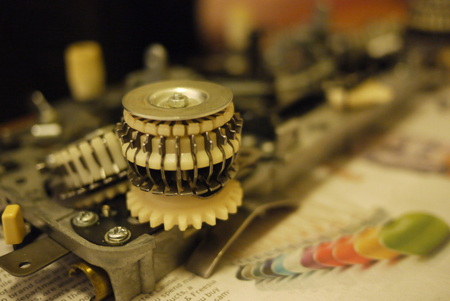 All the manuals say not to take the carriage apart, but I had to do this, as one of the drums was completely stuck – the drums are at the back of the carriage and are supposed to spin freely; if not, the carriage won’t move across the needle bed. A nicely knolled workspace is essential. 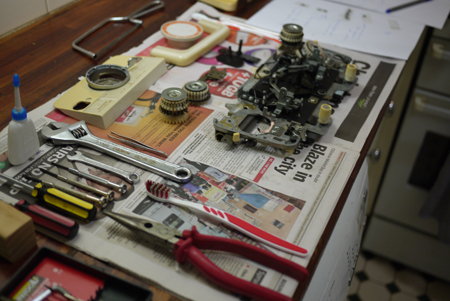 See 10 Bullets, #8: “ALWAYS BE KNOLLING” by Tom Sachs. 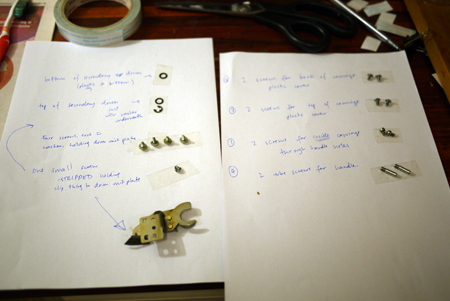 Double-sided sticky tape and lots of notes to know where screws and bits came from… and where they should go back. This entry was posted on Sunday, October 7th, 2012 at 11:14 pm and is filed under knitting & crochet & yarn, machine knitting. You can follow any responses to this entry through the RSS 2.0 feed. You can skip to the end and leave a response. Pinging is currently not allowed. YOU ARE TOTALLY MY NEW HERO for this post!!! 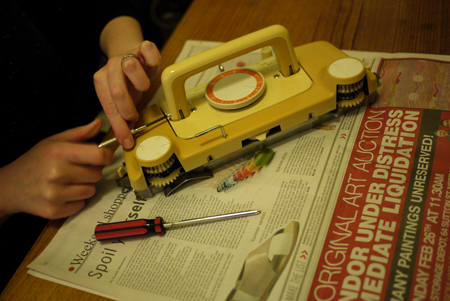 I bought a used knitting machine and have been looking all over the interwebs for info on cleaning the carriage… And thought it couldn’t be done without disaster! This post gives me hope! Thank you!!! It definitely CAN be done without disaster! Thank you for this comment, it was the spur I needed to get me to write the next post. Hope it helps! Let me know if anything’s unclear and I’ll do my best to explain.